My T.G.I.F. email just moved to Monday this week and I’m REALLY sorry because there was some Breaking News that you may have missed….Friday was National Chocolate Chip Cookie Day! Molly said it best, “Kathy, the best chocolate chip cookies are the ones you make, especially if you’re baking with girlfriends or family, especially my grandkids”. Molly continued, “my favorite is oatmeal chocolate chip. Then she sighed and smiled… well maybe oatmeal double chocolate chip warm out of the oven”. She almost had a reverent look on her face. Lisa’s favorite was to add cherries and almonds to basically the same recipe. Well, that’s all I could think of this weekend. I craved warm cookies. And, geez all I got was Cooking Stress! We all know I don’t cook but now I’m going to learn. Friday night I had to make do with chocolate chips out of bag and, of course, our 2005 Syrah. Please include your full contact information. 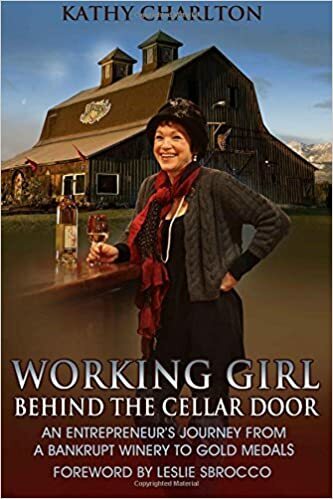 The winning recipe will be posted on our website and a Working Girl Goodie box full of lots of great items from our gift shop and the wine you “paired” with your cookies will be shipped to the winner. P.s. If you need a really good wine to do some sample pairing, remember our double gold medal (or is that double chocolate) 2005 Syrah is our featured 30th Anniversary Wine in May. Anniversary Price $17.49, regular price $24.99. Ralph and I were heading out the door and as usual my husband picked up his wallet and put two quarters in his pocket. Laughing we realized we didn’t even know how much it cost to use a pay phone and if we needed one… could we find one in a hurry? We both paused, each in our own world with a distant look and a smile on our face, thinking about our Moms. At first, all I could think about was my Grandmother who told me always to put on clean underwear in case I was in an accident. Even as I kid I found that pretty silly. Well that started it… back and forth, till we were almost crying with laughter. Some of our favorite Mom-isms! Do you want me to call your Dad? Turn off the lights, do you think we live in a barn! If everyone else jumped off a cliff, would you? Eat your vegetables, there are starving kids in China. Put that down, you don’t know where it’s been! I’m going to finish this last Mom-ism. Kathleen Ann… if I’ve told you once, I’ve told you a thousand times how much I Love You. That’s what I remember most.